I want one of those for MY front door! It can be given to someone who has lost a beloved pet, or it can be used for human loss, too, with its symbolism. This gorgeous paper rose is also from the store at IBS. This is just gorgeous Colleen. I love that door decoration too! Your cards are always so special to look at. Beautifully done! This is GORGEOUS!! I loveeeeeee the colors, the bow, the pearls and love love love that birdcage!!!! So pretty! I love the colors and stamps! This is pure scrumptiousness, Colleen! LOVE the rich greens and soft creams! And all your textural layers are absolutely delish! LOVE! Love the colors on this gorgeous card, Colleen. I'm with you about the inspiration piece..would be lovely on a door. Love this colour combo so many have to squeeze a card in!! Your papers and card are fabulous! 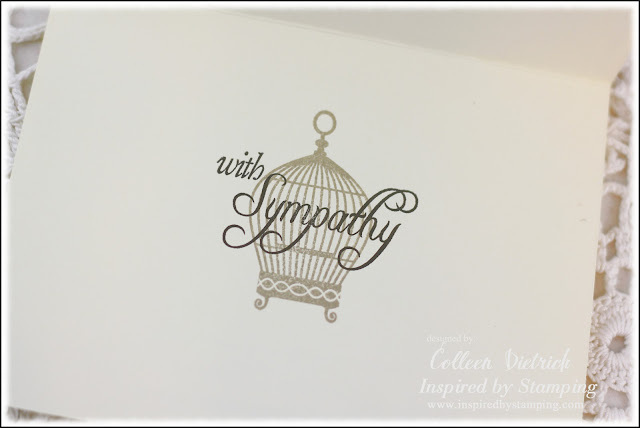 LOVE the papers and stamps you chose for this very comforting sympathy card, Colleen! Gorgeous bow and flower, too! This is beautiful, Colleen...I love the regal colors, the gorgeous twine accents and pearls! OH MY! Green is my fav color!! 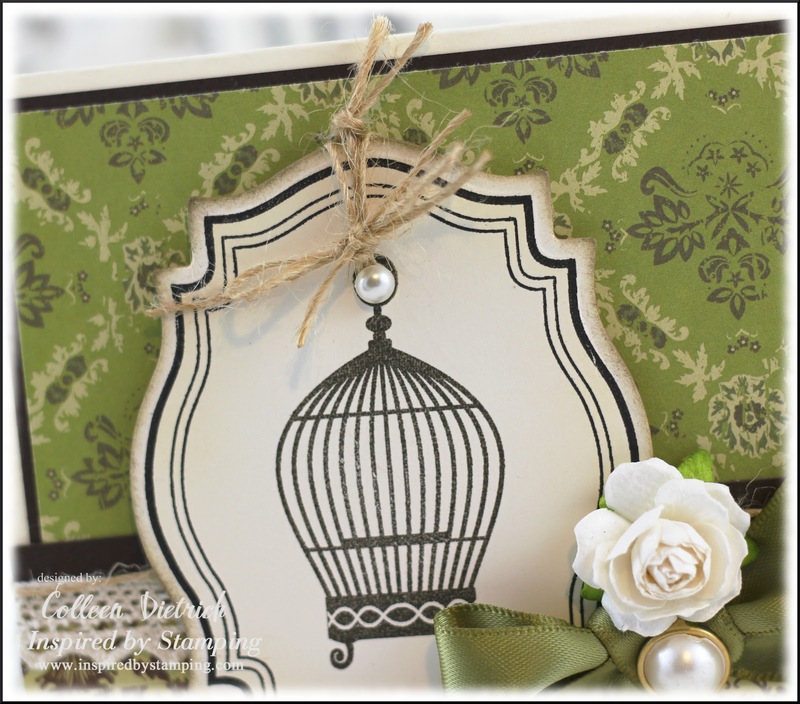 LOVE LOVE LOVE these papers and that ribbon and that cage! LOVE it all! I LOVE how you stamped on the inside too!! Wow! Awesome bird cage, so pretty! Lovely dp, ribbon, and flower, too! 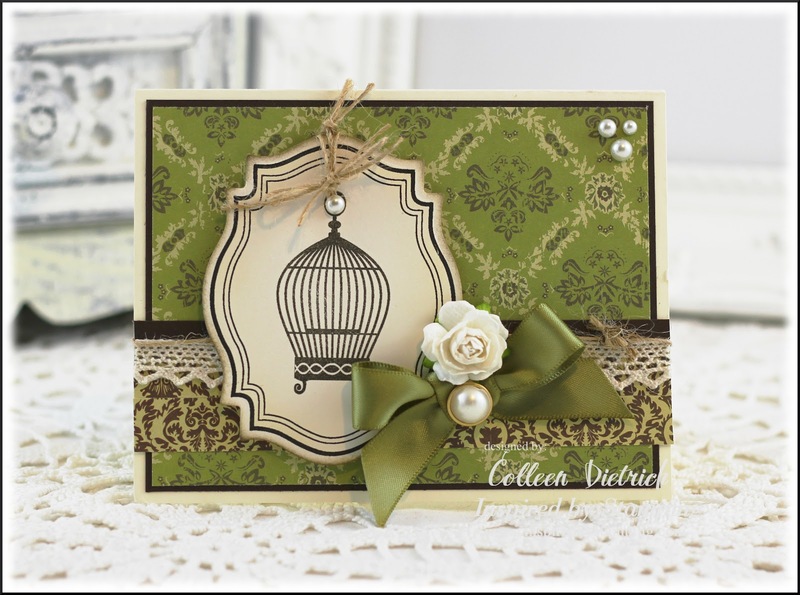 A very elegant and pretty card inside and out! Take care and have a wonderful weekend, hugs! WOW, Gorgeous card Colleen!!! I love this color pallet! The papers are beautiful and love the trimmings, ribbon and brad:) Great design! WOW! This is a gorgeous card! I love the paper you used and all the delicate embellishments.. Absolutely gorgeous Sympathy card! Love it!